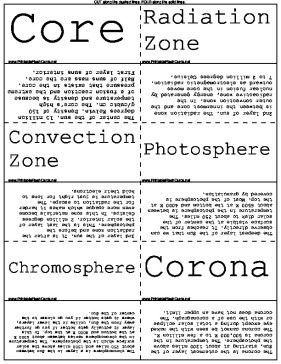 Great for astronomers, these flash cards describe the layers and movements of the sun. Core The center of the sun. 15 million degrees Kelvin. Density of 150 g/cubic cm. The core's high temperature and density is because of a fusion reaction and the extreme pressure that exists in the core. Half of suns mass are the core. First layer of suns interior. Radiation Zone 2nd layer of sun. The radiation zone is between the innermost core and the outer convection zone. In the radioactive zone, energy generated by nuclear fusion in the core moves outward as electromagnetic radiation. 7 to 2 million degrees Celsius. Convection Zone 3rd layer of the sun. It is after the radiation zone and before the photosphere. This is the last layer of the solar interior. 2 million degrees Celsius. In this zone materials become even more opaque which makes it harder for the radiation to escape. The temperature is just right for ions to hold their electrons. Photosphere The deepest layer of the Sun that we can observe directly. It reaches from the surface visible at the center of the solar disk to about 250 miles. The temperature in the photosphere is between about 6500 K at the bottom and 4000 K at the top. Most of the photosphere is covered by granulation. Chromosphere The chromosphere is a layer in the Sun between about 250 miles and 1300 miles above the solar surface which is the photosphere. The temperature in the chromosphere varies between about 4000 K at the bottom and 8000 K at the top. In this layer it actually gets hotter if you go further away from the Sun, unlike in the lower layers, where it gets hotter if you go closer to the center of the Sun. Corona The corona is the outermost layer of the Sun, starting at about 1300 miles above the photosphere. The temperature in the corona is 500,000 K to a few million K. The corona cannot be seen with the naked eye except during a total solar eclipse or with the use of a coronagraph. The corona does not have an upper limit. Solar Flares Solar flares extend out to the layer of the Sun called the corona. The corona is the outermost atmosphere of the Sun, consisting of highly rarefied gas. This gas normally has a temperature of a few million degrees Kelvin. Inside a flare, the temperature typically reaches 10 or 20 million degrees Kelvin, and can be as high as 100 million degrees Kelvin. As the magnetic energy is being released, particles, including electrons, protons, and heavy nuclei, are heated and accelerated in the solar atmosphere. A variety of electromagnetic rays and beams are sent out due to this discharge of energy. Sunspots Area on the Sun that appears dark, because it is cooler than the rest of the surface. Elements of sun Aluminum, Copper, Iron. Gases in nuclear reaction son sun Hydrogen, Helium, incandescent gasses.